Long before she would found Fairy Tail, first master Mavis Vermillion is left under the care of the Red Lizard guild. Abused and belittled at every opportunity, she is forced to complete difficult chores. Despite this horrific treatment, Mavis refuses to cry, for if she did, she would not be able to meet the fairies. However, her life of servitude comes to an abrupt end when the Blue Skull guild raids her home, leaving only Mavis and the guild master's daughter Zera alive. For many years, Mavis and Zera live alone, taking care of each other. But this all changes when a band of treasure hunters come to the island in search of the Tenrou Jade—a precious gem that is sacred to the island. With the arrival of new faces, her life begins to change again. Mavis has never stopped wishing to meet the fairies, and now she may finally have the chance to find them. 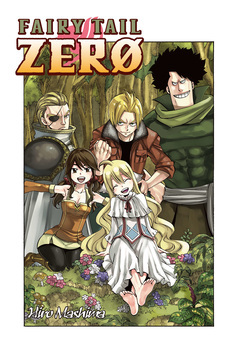 Fairy Tail Zerø was published in English by Kodansha Comics USA on July 12, 2016. It is set to release in Spanish by Norma Editorial on October 29, 2016. Simply fantastic, can be influenced by my adoration of Mavis, but I liked much of the story with her as protagonist, Mavis is a character that is hard not to sympathize, I thought I would tell to the end the story of Mavis, but even being up the creation of the guild was actually really 13 chapters that I liked more than any major, ok some will say I'm exaggerating, but there is no words to describe how this sleeve is perfect, a summary fast it: mavis child, mavis crying, mavis happy, sad mavis, mavis in the bath, using magic mavis, mavis almost dying, so ... are many mavis. Mavis is the best waifu! Well this is one of the proofs that Mashima can make a story without an asspull power of friendship. A believable way to make characters stronger, a reaction to an action that hasn't been reversed like we so often see in Fairy Tail. Yes, there are some predictable things about certain characters and if you read Fairy Tail prior to reading this then there's not much of a tension or sense of real danger. 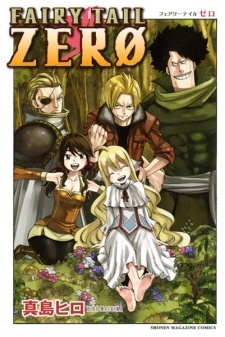 On the other hand reading Fairy Tail Zero doesn't require reading Fairy Tail, it can be a stand alone manga and work perfectly fine, so all in all a decent 8 out of 10. While we are familiar with most of the main cast Yury is the new one and I much enjoyed his path from the treasure loving individual to the character we reach in the end. Mavis, well how she grew up was quite cliche to be frank, but in the end she is a decent character, nothing more, nothing else. The villain of the story didn't leave any significant impact on me, the fact that he wasn't fully defeated did impress me to a certain extent though. It's just that it never felt like he had that villain vibe you get, just not enough of an impact. The ending scene with him is a very nice touch though. To every Fairy Tail fan out there, this is a must read. I was thrilled when I found out that there was a spin off on Mavis, she in my opinion is the most adorable character in the whole series. My hopes were high, but I came to see how Fairy Tail was actually formed. The manga tackles the recurring issue of 'Friendship' in this spin off too, but with a new cast of characters. Till chapter 12, Mavis along with Precht Gaebolg the second guild master, Yury Dreyar the father of Makarov and Warrod Sequen one of the magic saints. The manga brings new and exciting events in the current 12 chapters, the learning of magic and pain of losses. Till now to the manga has met my hopes and kept me excited till the last page. I request every Fairy tail fan to give this a shot. If you haven't read of watched fairy tail, skip this manga as you won't enjoy it quite as much.